Our New York City Pest Control Exterminator will identify the source of the pest infestation and create a customized treatment plan to eliminate the pests. 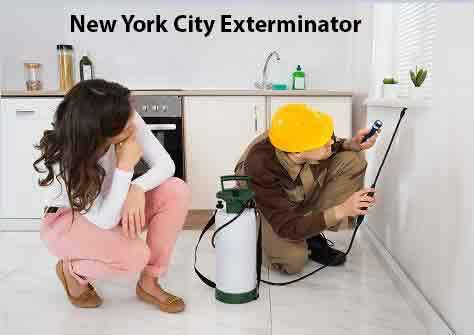 Let us be your New York City Exterminator, give us a call today 1-844-305-8999. Silverfish enter a house on their own or in a container such as a box that has been stored outside. Silverfish are usually found in damp areas with high humidity, such as basements, laundry rooms, bathrooms, and kitchens. Silverfish eat a wide variety of food, especially carbohydrates. Silverfish require a large supply of starchy foods or molds to survive. They feed on paper, photographs, wallpaper paste, starch in clothes, fabrics such as cotton and linen, and any foods rich in carbohydrates that they find in the house. Silverfish are wingless insects that are ½-inch long when fully grown. At New York City Pest Control we specialize in eliminating Silverfish. Cockroaches and Water Bugs have been reported to spread at least 33 kinds of bacteria, six kinds of parasitic worms and at least seven other kinds of human pathogens. Waterbugs are nasty insect pests that have been around for 300 million years. Water Bugs prefer to live in warm, humid places close to food and moisture sources. They are frequently found in residential and commercial kitchen environments, and bathrooms. There is no worse feeling then turning on your Kitchen Light and night and seeing a Waterbug on your countertop. At Dependable Exterminating we are Experts in Water Bug Extermination. Because Cockroaches and Waterbugs dislike light, they disappear during the day time into dark places, including the undersides of appliances like stoves and refrigerators, underneath sinks or other installations, near plumbing, inside light switches and behind wall paneling or doorjambs. Wondering how to get rid of cockroaches call our New York City Exterminator at Dependable Exterminating.